Here is a picture of Haitian writer Kettly Mars. 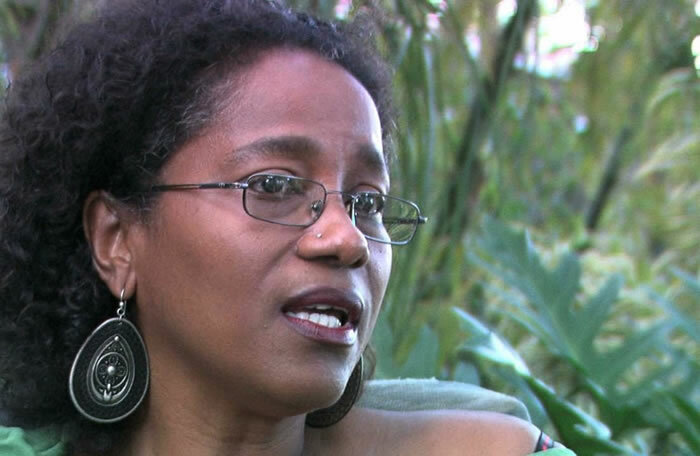 Kettly Mars (born September 3, 1958) is a Haitian novelist, poet, and essayist. She is one of the most successful Haitian writers of today. For the past twenty years, she has portrayed the sincere and insightful aspects of her country's common peoples' joys and suffering, their emotions, and desires in a precise language which is not only breathtaking but heartbreaking as well. Although her novels and their themes are based on Haiti, they have universal approach with diversified social classes, genders, human race, spirituality, power and violence. She studied classical language and spent first twenty-five years of her career in office administrative jobs. She had love for poem since her young age, but her creative impulses made her to write first poetry when she was thirty-five, perhaps with some reluctance, because they were very much different from her later matured works. Her first poetries were erotically charged with the importance of love, nature, human body and sexuality in everyday life. She proceeded to write with a new style since 1996 and received her first prize in the Jacques-Stephen Alexis contest which further encouraged her to write poems, short stories and novels with inspiring love, the beauty of nature and everyday objects. Kelly started writing about realistic and vivid paintings of societies which are tormented by deep economic and political antagonisms. Kettly writes in French and her books have been translated in English, Dutch, Italian, Danish and Japanese. Her first major collection of short stories and poetry, "Un parfum d'encens", was published in 1999. Her first novel "Kasale" came out in 2003. "Kasale" has deep root in Haitian culture and the voodoo spirituality. It tells the story the of common villagers' struggle for existence against unknown super powers. The first novel was followed by L'heure hybride (2005), Fado (2008), Saisons sauvages (2010), Le prince noir de Lillian Russell, with Leslie Péan (2011), Aux Frontières de la soif (2013). Recently on November 21, 2015, she has been honored with the "Prix Ivoire Award" by the jury for African Francophone Literature in French for her novel "Je suis vivant (I am alive)" published in April 2015 by Mercure de France Press. "Prix Ivoire" is an important literary prize awarded every year by the Ivorian Ministry of Culture and Francophone and the French Embassy in Cote d"ivoire at the initiative of the Ivorian Association for Akwaba Culture.